Huh. What does that say about me? All these flowers are old-school flowers! Does that mean I’m an old fashioned kind of gal? Nah. They just smell heavenly and remind me of growing up on the farm. I finally have lived in a house long enough for the lilacs that I planted to bloom! Every house that we built, I would plant lilacs, with dreams of someday gathering them into my greedy clutches, planting my nose deep inside their purple-ness, and inhaling their memory-inducing bouquet. Then, I’d clip them into a huge white bucket (oh, the senses!) and bring them indoors to fragrance the whole house. Alas, we always moved before my bucket-of-lilacs dream came true. Until now! I have two large lilac bushes near my front door, and if the deer don’t chomp them down, they bloom like crazy. So, in response to the Bucket of Lilacs dream, I decided I’d paint just that. Yes! 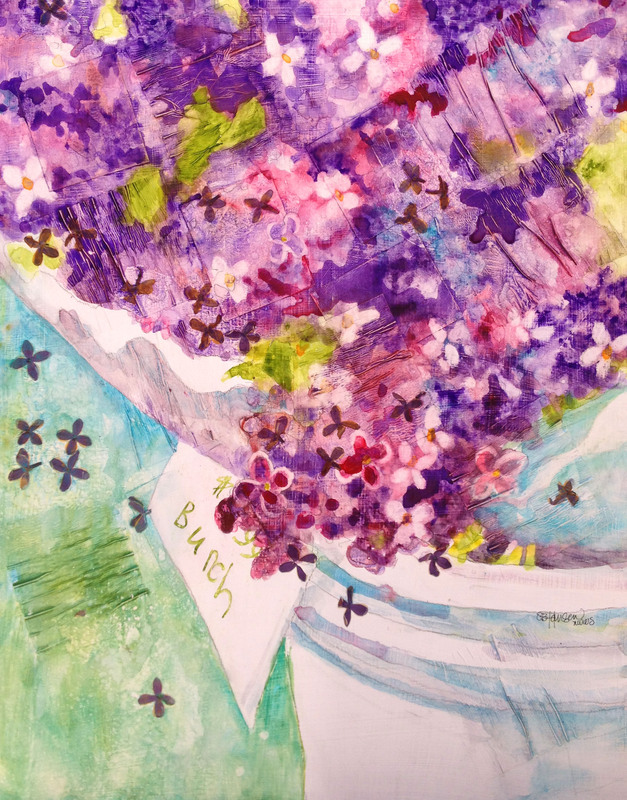 I DID place blooms into my painting. Carefully clipping each tiny bloom, I placed them in between newspaper and flattened/dried them overnight. The next day, I used matte Medium to adhere them to the gessoed plexiglass panel. It was so much fun, I thought I might plaster them everywhere! But I had to use restraint. 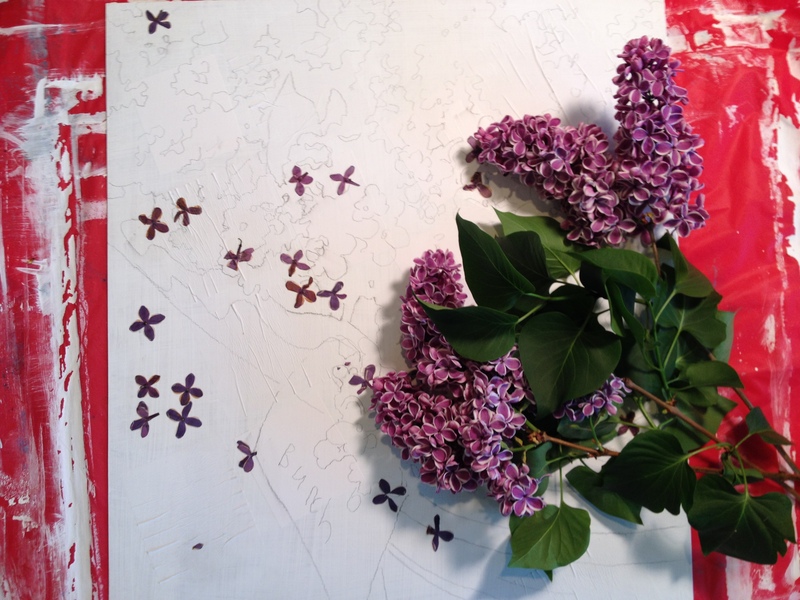 I had only clipped a few lilacs and it was time to paint. No time to waste! Okaayyy…great idea, hard to do. 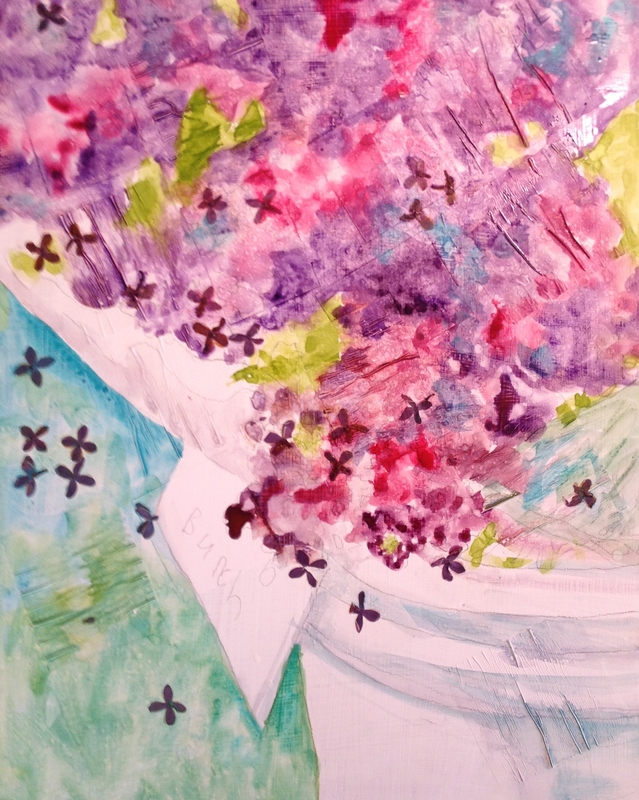 Have you ever painted lilacs? Or tried? A bit difficult, I can tell you. As always, I concentrate detail in a few areas near the focal point, and leave ya’ll guessing for the rest. 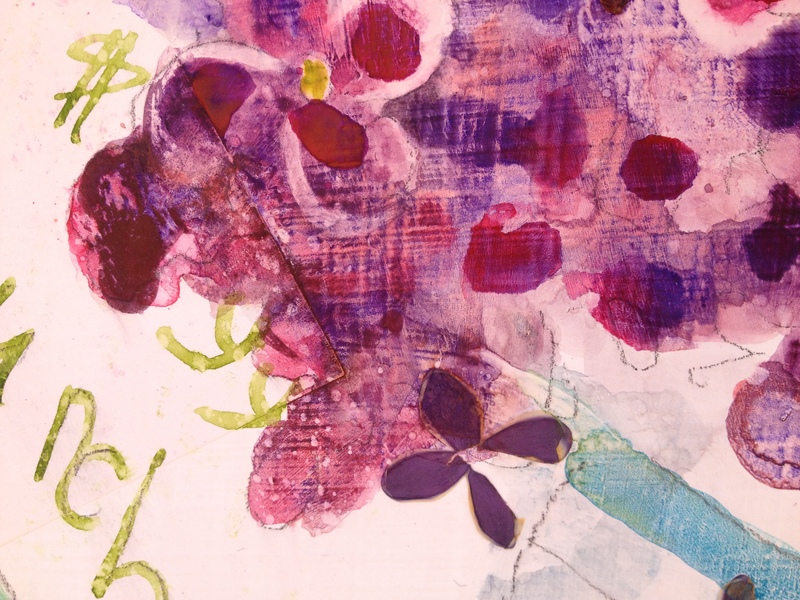 The most difficult part of this painting was trying to get the mass of blooms to have depth and structure. The colors in this painting? Yummy. I hope I gave the impression of lilac blooms? Can you recall memories of lilac-filled days? Maybe you can smell them? Love this one! I love lilacs and peonies as well! They remind me of my childhood. Totally agree! 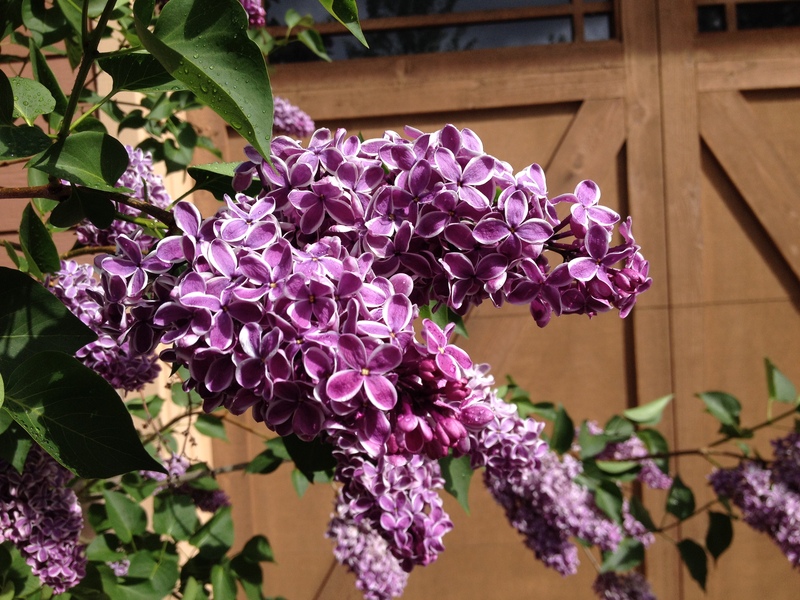 Lilacs make a fantastic object. My are blossoming, too. Almost over, though. Too bad, I didn’t get time to make a nice painting like yours. Yes, mine are done this week, too. Sort of wilted and faded out. Have you tried to paint them? Tricky! This is beautiful! 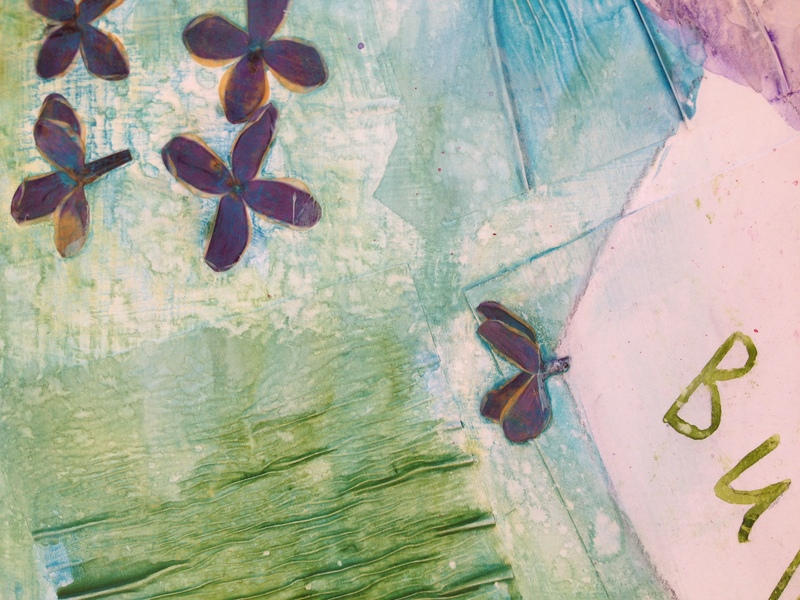 I love the texture in the gesso, it almost reminds me of a quilt.